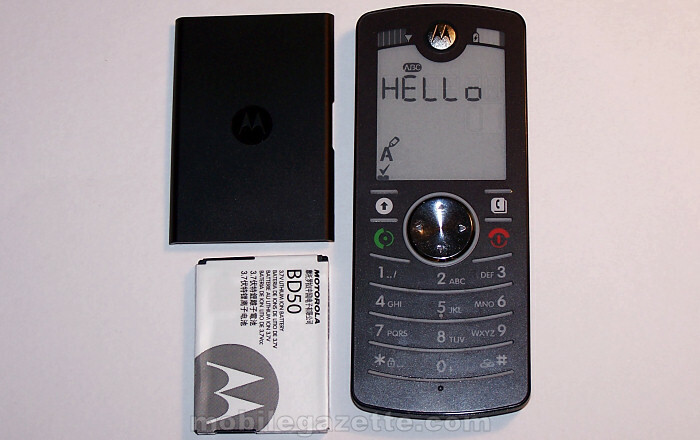 The Motorola FONE F3 (sometimes called the MOTOFONE) was announced a year ago, but it has only very recently been available in the UK (see the bottom of the page for more information). It's an interesting phone for a variety of reasons, not least the fact that it is incredibly inexpensive (at around £25 / €40 SIM free, cheaper with prepay) and very simple to use. When we showed the MOTOFONE F3 to people and asked them how much they thought it would cost SIM free, most people came back with a price of around £200 / €300. So how come this simple little mobile phone is so impressive? What's in the FONE F3's box? If you're interested in the full unboxing pictures of the FONE F3, click here. 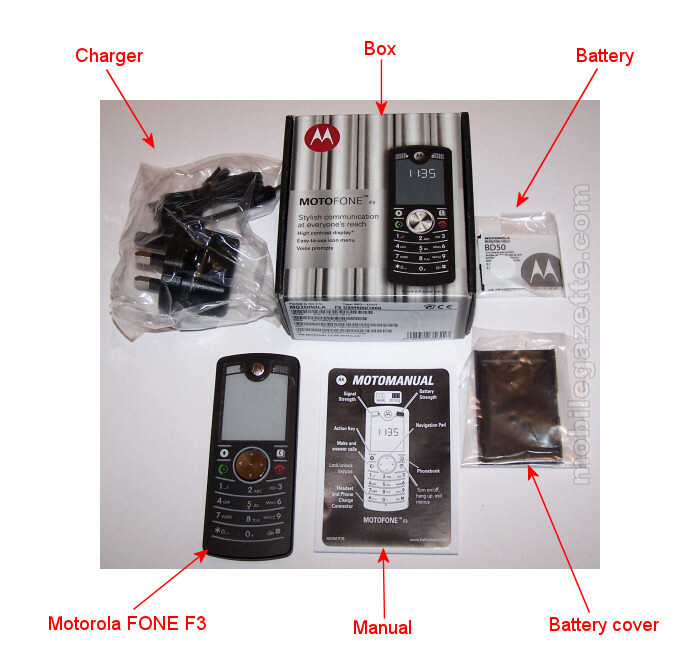 Else, you can see from the picture below that the MOTOFONE is a quite neat package in a small box which includes a charger, battery (Motorola BD50), battery cover and a manual. The manual itself folds out and covers the FONE F3's fairly limited feature set very clearly. At 112 x 46 x 9mm and just 70 grams in weight, the Motorola FONE F3 is substantially slimmer and lighter than most phones on the market. The front of the phone looks like a typical Motorola design with a flat metal keypad and large navigation pad. There's a monochrome display on the top measuring approximately 1.9 inches. On the side is a jack plug opening for the power charger and optional headset. The keypad looks like a typical RAZR-style layout, but it's quite a bit easier to use as there is a raised plastic border between each row of keys, and this has bumps on it to make it easier to find the correct key by touch. The 5 key also has a raised plastic piece to identify it. The MOTOFONE's keypad is surprisingly easy to use and it also has a backlight to help in low lighting conditions. Overall, the construction quality of the FONE F3 seems to be very good. There are few openings in the case and all the panels fit quite closely, which indicates to us that the FONE F3 should be somewhat resistant to dust and dampness too. It is an unsually flat design, and when combined with the MOTOFONE's unique display, it does look rather more like a retail store dummy handset than a real phone! 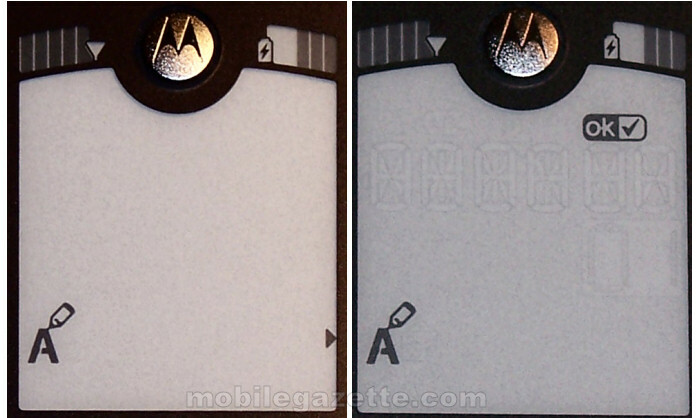 Technically the most interesting part of the Motorola FONE F3 is the panel. It's an electrophoretic display (EPD), which is basically a type of electronic paper (or digital ink) solution where each particle flips over, a little like a reversi piece. This is quite unlike the LCD displays found in most phones, because an EPD display looks very much like a piece of paper when you read it. This technology means that the Motorola FONE F3's screen is thinner and lighter than a conventional LCD, and it also consumes less power. In theory, it should also be cheaper when produced in sufficient volume. One major advantage that the FONE F3 has over any almost other type of mobile device is that it can always been seen clearly in full sunlight as the picture below demonstrates. 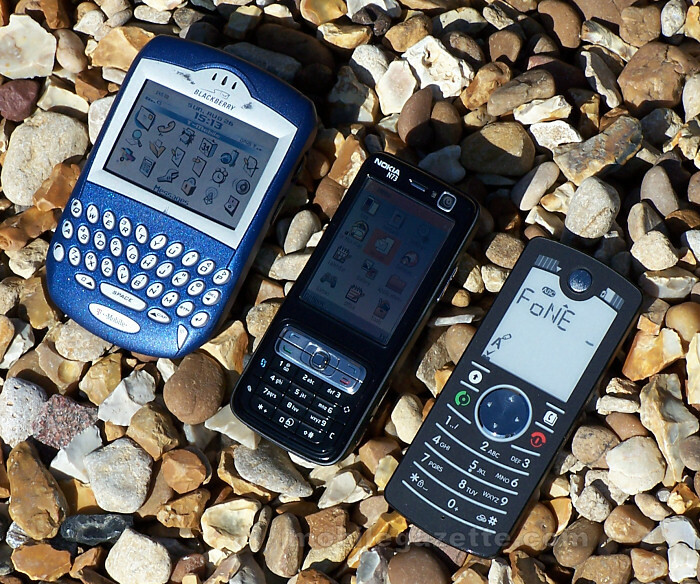 From left to right the handsets pictured are vintage BlackBerry 7230, a Nokia N73 and the Motorola FONE F3. As you can see, the display on the Nokia N73 is very difficult to read under the direct glare of the sun. The BlackBerry comes with an unusual transflective display that does rather better, but the FONE F3 is clearly readable in these conditions. Unlike any other mobile phone we can thing of, the Motorola FONE F3 does not use a matrix display. Instead, different symbols are predefined - rather like the LCD display on a car or clock. Text displays use a set of six fourteen segment characters, and there's a secondary row of numeric characters (which are useful for displaying the date). This fairly limited layout can make texting a bit of a pain. 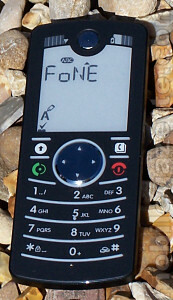 You can also see that the MOTOFONE appears to mix upper and lower case, but in reality the FONE F3 actually sends in lowercase only (so in the picture below, the if that text message were sent to a conventional handset it would read pack my box with five dozen liquor jugs and not PACK My boX WITH FIVE doZEN LIQUoR JUGS as it appears! One unusual feature of the EPD display is that artifacts tend to be persistent unless the screen is refreshed (this typically happens when the screen displays the clock which is light-on-black). You can see below that the "ghost" of previous characters builds up (on the screen on the right). Although the EPD display in the MOTOFONE scores well in direct sunlight, in the dark it is much more difficult to read. This is because the FONE F3's display is rather like a piece of paper that's dark on one side and light on the other. If you put a light behind it, then you'd always get a grey because the light and dark elements of the display are always in the way. To get round this, the FONE F3 lights the display from the sides. As you can see, this isn't as easy to read as the display on the Nokia N73 we say earlier, but then the display on the FONE F3 (plus its inbuilt voice prompting) means that the MOTOFONE is still usuable. One major advantage that the FONE F3's display has over other devices is its lower power consumption - in fact, the display requires no power at all in a steady state. A simple way to demonstrate this is to remove the battery - as you can see from the picture below, the display is still in place! The MOTOFONE's user interface is remarkably simple. The Action key in the upper left corner selects an item, the Navigation pad scrolls through them and that's pretty much all there is to it. There's a dedicated key for the SIM card address book, a call and hang-up button plus a standard number pad and that's it. When you turn the FONE F3 on, it asks you if you want to use voice prompting. This is a pretty advanced feature for such a simple phone. You can also set nine quickdial numbers, use a speakerphone while in the call and there's a keylock, vibrate function plus a number of other functions, the more advanced of which will require looking in the manual. When texting you'll find that the FONE F3 displays in mixed case, but actually only sends in lowercase. The MOTOFONE lacks any predictive texting, but then this would add to the cost. The speakerphone and ringing tones are quite loud and should be useful in most environments. Remember that this is a very simple phone - there's no web browser, Bluetooth, MP3 player or even a colour display. You can make calls, deal with text messages, set an alarm and really that it. 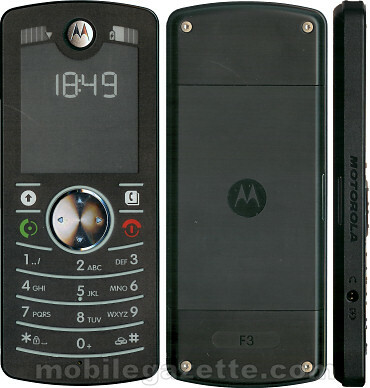 Who would use the Motorola FONE F3? Clearly any phone that costs around £25 / €40 for a SIM free handset is likely to appeal to those people who are looking for a really inexpensive phone. But there's something more impressive with the FONE F3 than with many other cheap phones. When you pick the MOTOFONE up you can tell that's it's well made, everything fits together properly, and the handset is very well thought out despite its limitations. We tried a little experiment using the FONE F3 and the technically awesome Nokia E90. Perhaps not the most scientifically valid experiment ever, but we did show various people both the E90 and the FONE F3 and the surprising thing was just how many people were impressed with the FONE. Not in technological terms, but because they saw the FONE as being very stylish, slim and simple to use.. and everybody was very surprised when they found out how little it cost. 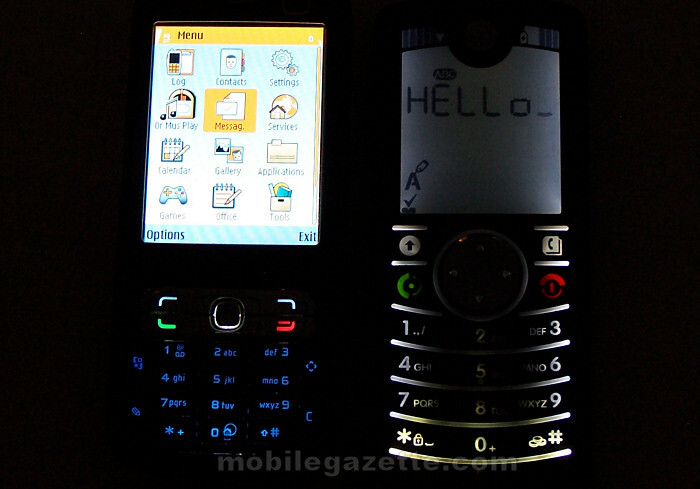 Now, most Mobile Gazette readers love their gadgets, but prefer them to be more.. well, gadgetty than the FONE F3. But this is a great second phone, especially if your main device is a bulky smartphone. It also works well for anybody who spends a lot of time outdoors, either for leisure pursuits or work. At 70 grams and 9 mm thick, the FONE F3 will squeeze into pretty much any pocket or bag.. and if you work outdoors then it's likely to withstand the odd bit of dust, and even if you ruin the phone, you can get another one quite cheaply. The Motorola FONE F3 isn't without its faults - texting is a bit of a pain, the backlighting isn't that good and here's a phone that would really benefit from Bluetooth for people who wanted a no-fuss business phone. However, you can tell that a lot of effort went into the MOTOFONE's design and it is incredibly elegant and straightforward to use.. and a real bargain too. We're definitely going to keep hold of the review model! If you'd like to see a video of the FONE F3 in action, check out our YouTube video below.